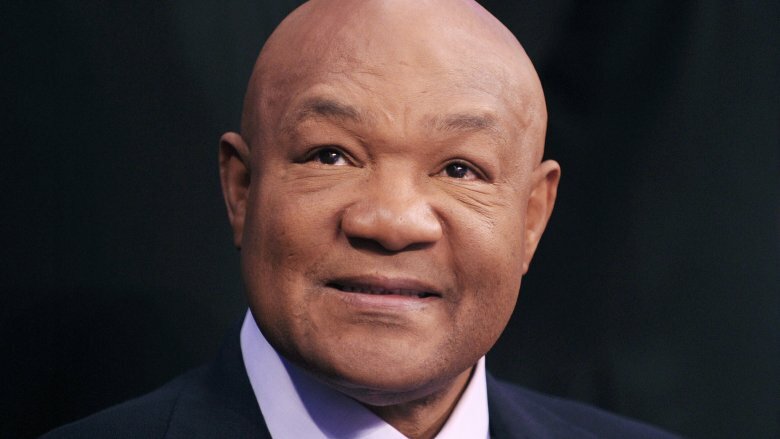 George Foreman's meteoric rise to becoming a boxing lodestar began after he competed in his first match in February 1967 when he was just 18 years old. The following year, in October 1968, he was crowned an Olympic gold medalist. Despite reigning supreme as a two-time world heavyweight champion, years-long hiatuses would eventually pull him away from the sport he loved. 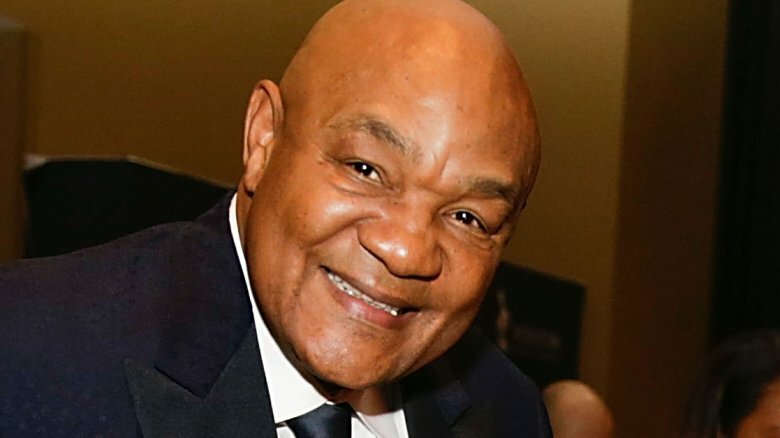 He hung up his boxing gloves for the final time in 1997, and his career pivoted when he became the man behind the George Foreman Grill. By lending his name to the "lean, mean, fat-reducing grilling machine," he earned a staggering $137 million from a 1999 licensing deal, according to the New York Post. 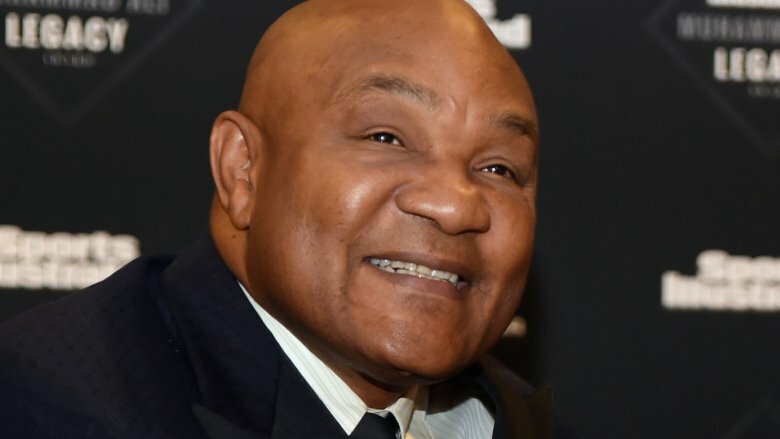 Could this whopping payday be the reason why Foreman, his infectious grin, and his affable personality seemingly faded away from the public eye? Is he so content with his sports and business earnings that he no longer feels the need to grace us with his presence? Well, that's doubtful. 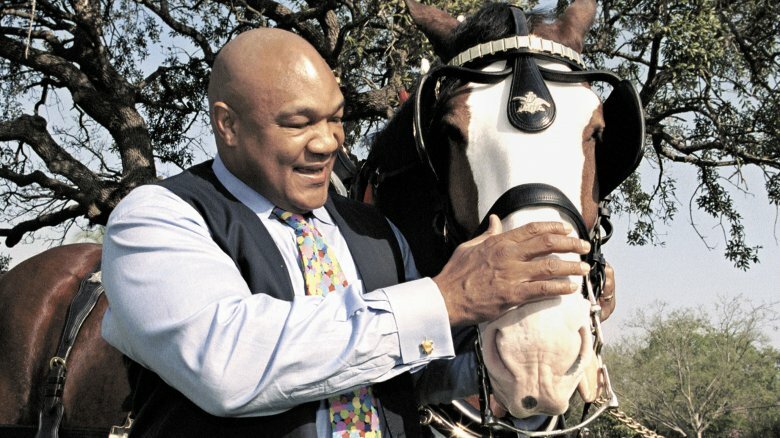 The truth is that this boxing Hall of Famer has a lot going on, from tending to his stable of livestock to finding new ways to hide his growing car collection from his wife. Sneaky, sneaky. How did he go from exchanging punches with boxing legends like Joe Frazier and Muhammad Ali to falling off our radar? 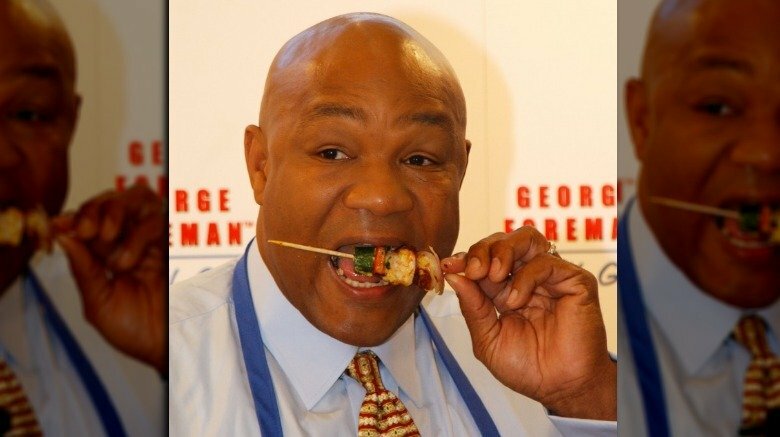 Here's the real reason you don't hear from George Foreman anymore. 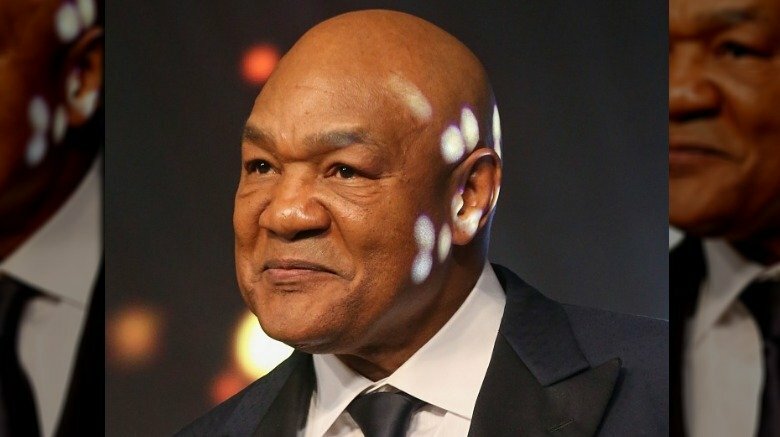 George Foreman has been known to pull numerous disappearing acts throughout his time in the spotlight, beginning in 1977 after he lost a match against Jimmy Young. Foreman told Belief Net that, after accepting defeat, he headed back into his dressing room and a flurry of thoughts raced through his mind. "I started thinking, I could go home and retire, I got money, I could retire right now to my ranch and die. And before I knew it, that had taken over my whole conversation — You're gonna die," he recalled. The overwhelming thoughts sent him into a panic, and he began to "smell death." But things got even crazier. "And I said, as a tough man, I've always been tough, I said, 'I don't care if this is death, I still believe there's a God.' When I said that, a gigantic hand snatched me out of this 'nothing,' and I was lying in the dressing room bleeding, blood flowing through my veins." After receiving medical attention, Foreman recalled jumping into the shower and screaming, "Hallelujah, I'm clean, I'm born again, I'm going out to save the world!" He began attending church, but, when he was unable to preach to the congregation, a "kid" at his church convinced him to spread The Word in an alternative way. "I [began] traveling from one street corner to another, three-fourths through Louisiana, Tyler, Texas, all around Houston," the iconic pugilist told Belief Net. He eventually became an ordained minister and initially began preaching at The Church of Lord Jesus Christ in Houston in 1980, before buying a 30-minute block of time at a local radio station to reach the masses. "On my show, I talked a little about boxing and a lot about the good Lord," he wrote on his official website. While he certainly made a name for himself after pummeling his opponents in the ring, his fight against sin has been far more rewarding. "I'm a minister and this is my true profession. This is really my calling," the told The Times. So, if you really miss his presence in the public eye, you know where to find him on Sundays, at least. 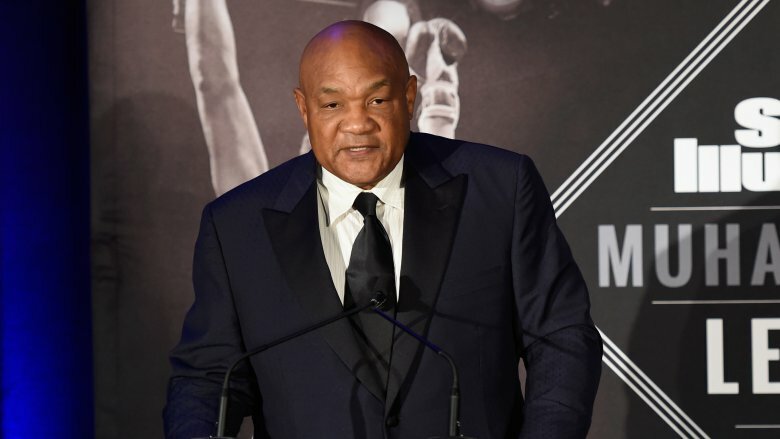 Following his aforementioned 1977 loss against the late boxer Jimmy Young, George Foreman took a long break from the sport and focused his time on establishing a youth center in Houston, Texas with some help from his brother-in-law. However, after ten years of being away from the ring, he begrudgingly returned to the sport in 1987. "Finally I was broke, I would have to close the youth center if I didn't quickly move. The only way I knew how to make money and not to beg people for it was to be a boxer again. It hurt me to take my shirt off again and be a boxer but it was the only profession I had. And that's why I went back," Foreman told Belief Net. Just think: If he had been able to financially support himself and his youth center, he probably would've never made his surprising 1987 comeback! There was once a time when Foreman's face was everywhere, and it was all because his friend Bill Cosby convinced him to become a spokesperson. Foreman later went on to appear in a bunch of commercials for giant companies, such as Nike Air and Kentucky Fried Chicken. That all came to a halt, however, when another friend suggested he stop hawking other companies' merchandise and develop a product of his own, and that's when he got an offer that would change his life. "So I got the call from a company who asked me if I would like to promote their grill and call it the George Foreman grill. I said 'How much money is in it?' and they said 'There is no money in it at the moment.' It was a chance for me to start it right from the bottom and I liked the grill," he told Sabotage Times. After doing a few infomercials, college kids and health aficionados went bonkers over the product, resulting in royalty checks galore for Foreman. "And before we knew it we were selling millions," he said. He took his position as the name and face of the product seriously and would promote it by any means necessary, as he wrote in his memoir Knockout Entrepreneur (via Today). Now the product speaks for itself, and Foreman can kick back a bit and enjoy the fruits — or rather, meats — of his labor. He knows what it's like to have tons of cash, and he also knows how it feels to be dirt poor. 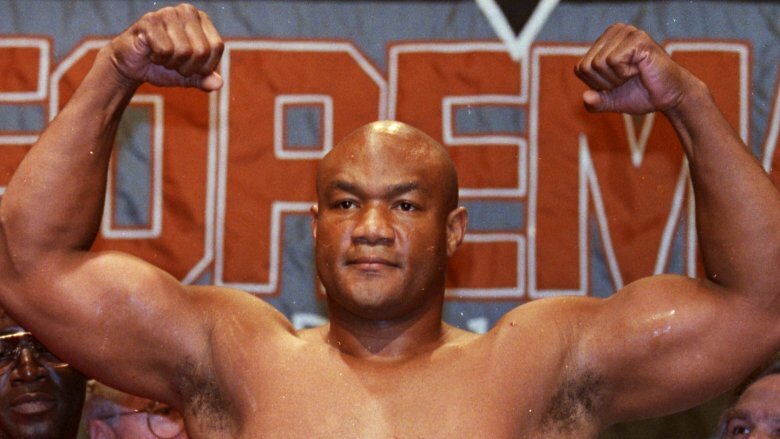 Reuters revealed the former heavyweight champion grew up in poverty in a rough neighbor in Houston. But after racking up wins in the ring, he was able to live the type of lifestyle he once dreamed about. If he could choose between living a modest life or living in the lap of luxury, Foreman would probably choose the latter, but he doesn't expect anything to be handed to him. He isn't afraid to roll up his sleeves and get to work to ensure a constant flow of Benjamins get deposited into his bank account so he can blow it all! "It's a curse to think you have enough [money]. There is never enough. George Foreman, Bill Gates—anyone. Money has to be spent. It is not made to be saved," he told Fortune magazine. This explains why you rarely hear from him anymore. He's too busy making money and spending it! During an interview with talk show host Graham Bensinger, Foreman revealed he spends a lot of his hard-earned money on his collection of fancy cars. He has it all — Corvettes, a Ferrari 360, and a Ford GT. However, his most prized set of wheels is a black 1977 Volkswagen Beetle convertible. It was the first car he purchased when he started making the big bucks, and, to him, it holds a symbolic meaning. "I got the Volkswagen, and the other cars are just dressing around it. … It's not the most expensive, but it's cherished with me, because you never forget where you come from," he told Bensinger. With over 50 cars in his collection (and counting), even he realized that maybe his hobby had gotten out of hand. "I've taken to hiding [the cars] from my wife now, and some are in different places," he admitted. Purchasing cars, driving cars, and stashing them in different locations has to be time consuming. No wonder he's poofed into thin air! 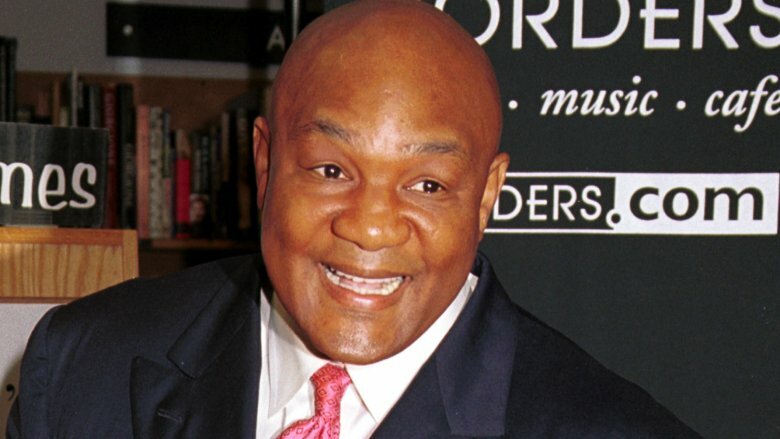 At the start of his heavyweight boxing career, Foreman stuck to traditional boxing workouts to maintain his muscular physique. However, following his second comeback in 1987, he found that weightlifting helped him rehab his sports-related injuries, and so now, you can frequently catch him going hard in the gym. Well, you can't actually see him. He's tucked far away from the hustle and bustle of the major city, pumping iron inside the 3,000-square-foot gym that he built inside his home that sits on his sprawling ranch in Marshall, Texas. The workout sanctuary has everything he needs and is fully equipped with "bicycles, a punching bag, and lot of weights," he told Texas Highways. He also told Muscle and Fitness that he works out. All. The. Time. "It's a way of life for me. My life is built around exercise. Sometimes I'm up at two or three in the morning, exercising," he said. Sheesh. Talk about dedication. He got the opportunity to travel a lot as a cast member on NBC's Better Late Than Never — a show that gathered up seasoned celebrities and followed them along as they experienced other cultures and ways of life. 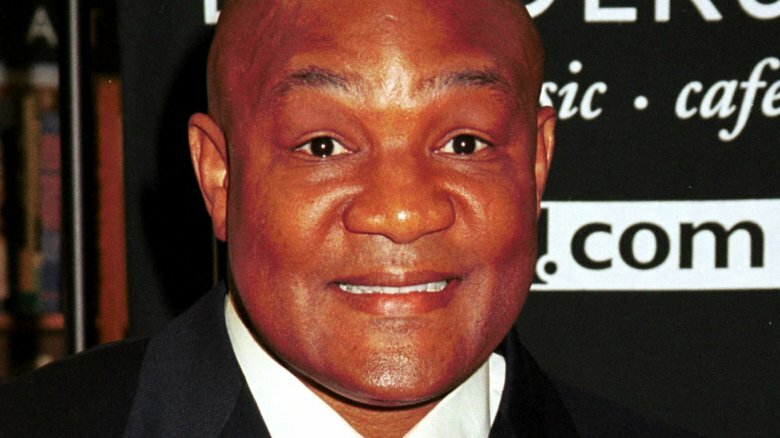 But even when reality TV cameras aren't following him around, George Foreman always on the move. "A major portion of my time is traveling. As a matter of fact I just got back from Germany this Monday, and I'll be traveling to England at the end of this month by way of New York," he told Texas Highways magazine. While we're sure he's having a ball wherever he goes, his trips are usually business-related. "I'm always invited out to speak and tell my story, the American story of which I'm so proud. And of course, I'm invited out to give my testimony about how I found God," he said. Well, that's one way to see Foreman in the flesh! 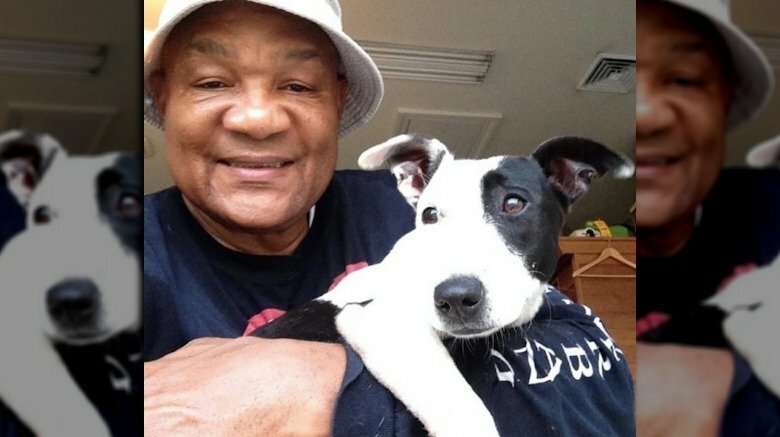 He had family that lived in the tiny town of Marshall, Texas — a few hours outside of Houston — so it only made sense for Foreman to make the city his home in 1976. "I stopped what I was doing, and we bought a ranch instantly," he told Texas Highways magazine. Living on 600 acres of land means Foreman has more than enough space for him, his wife, his ten kids, and all of his animals. "I raise a group of Brangus cattle, and my wife loves fresh eggs, so we keep a lot of chickens. It's a pig farm, too," he said. "And I raise horses called gaited horses, and I love those horses. I raise them and ride them and train them myself, and I'm always being bucked off." Welp, it sounds like Foreman has finally met his match! With a population of just over 23,000 people at the time of this writing, Marshall, Texas is a quiet town where Foreman can have tons of privacy away from the limelight. We can't blame him for exchanging his prominent presence in the public eye for days spent on his secluded piece of paradise. Now that he has left his boxing career in the dust, he's been expanding his business empire. It seems like every few years he comes up with some novel idea that consumers just eat up. Literally. But leave it to Foreman to take a different, more personal approach to selling beef to meat lovers worldwide. "You want to know about the cow's brother, sister, the spot he stood on. The grill was about health. And now I can spell it out to people with this food," he told Fortune magazine. In 2015, he gave Fortune magazine all the deets about his usual weekly schedule, which begins with him taking care of "business" on Tuesdays. Then on Wednesdays, he wears pink — wait, just kidding! Hump Days are actually dedicated to his ministries, and he also pops in on the aforementioned youth center he opened back in 1977. He left Thursday wide open, but, come Friday, he and his wife are heading out to their Marshall, Texas ranch to tend to all of their furry friends, including their horses and dogs. On Saturday evenings and on Sundays, he's back to preaching and teaching Sunday school. And on Monday, he has a day of rest. Finally. Don't feel sorry for him, though. He loves having a ton of things to do, even if it means he can't be in the spotlight like he used to be. "The best thing that can ever happen to a human being is a job," he said. "You don't have a job, you're going to die!" Man, those are some grim words to live by. 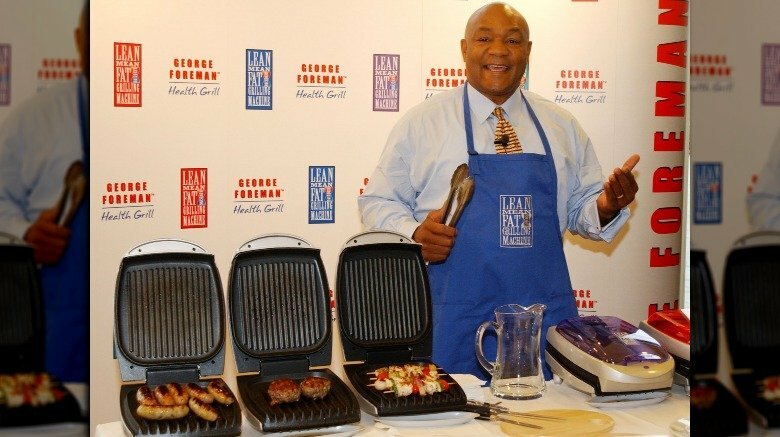 Sourcing Journal announced in October 2017 that George Foreman had a brand new business on his hands. 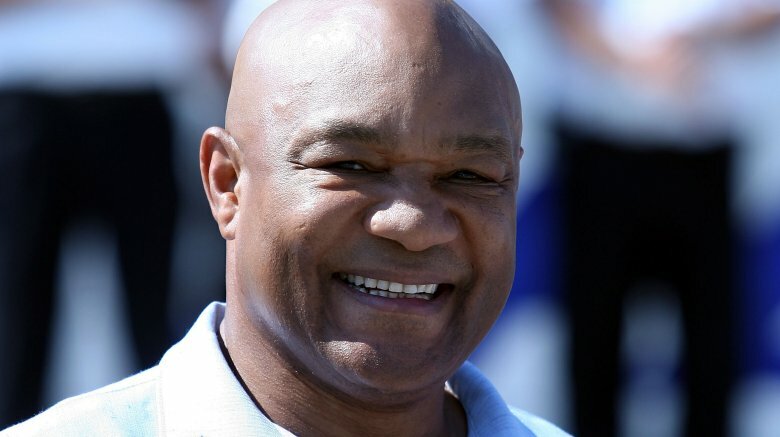 The Olympic gold medalist entered the footwear industry after partnering with an online retailer to design a line of comfortable shoes called George Foreman Collection by Footworks. The snazzy shoes, which were tailored for the 40-plus crowd, were specially crafted for men and women who live their lives on the go, just like Foreman. "I'm designing a shoe you can dance in, play shuffleboard with your kids, go to the airport, go to Florida — a shoe that's so comfortable that someone will have to make you take it off," he told Texas Highways. Let's recap: He has his grill, his church, his youth center, his ranch to maintain, a footwear line, and a range of delicious, juicy meat. Geez! The guy wears a ton of hats even when he's quietly living his life behind the scenes!